Even in the third edition/pathfinder mythos, you might say that magic itself is all the same. My understanding is that magic exists outside of the gods. It would be there without them. Most casters wrangle with the primal force of magic itself, while clerics receive their magic pre-packaged from their gods. Somebody still had to wrangle with the primal magic, the cleric just does it by proxy. That’s really interesting. 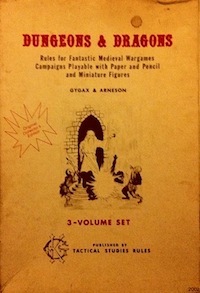 I just reread parts of the section on magic in the 3E Player’s Handbook. I had forgotten that the 8 schools of magic were extended to cover cleric magic as well in Third Edition. I had also forgotten how domain spells work, which is sort of an interesting system. It doesn’t really explain why, for example, wizards can’t learn to cast cure light wounds but bards can, though. Minor note: At least as far back as AD&D 1E a school of magic listing was provided for every spell, be it magic user, cleric, or druid. Good catch. It seems like 0E, 1E, and 3E have similar metaphysics, while 2E and 4E have more distinct types of power sources for magic. I think this would be the way to go if you were doing a semi-historical European 13th Century – 19th Century game (possibly with scientist sorcerers appearing in the 18th – 19th centuries). Yet I feel like there is something to havign divine magic, but maybe it should work different – requests from the divine – less controlled, more chancey? The “Immma be a super-sorcerer” problem is there I suppose, but limiting acquisition to magic is not hard – just make scribing magic difficult – multiple magical languages for various traditions/religions taught only to initiates – somehing like that. You may want to check out this old post of mine about the Christian magical tradition, and the source book I quote. I am using some of these ideas in my present campaign environment. In sacred magic, the act has the aim of restoring freedom to others; is carried out through holy means; and has Godhead as its source of power. Other forms of magic deviate from this script at the caster’s own spiritual peril, and tend to deny freedom to others, by enslaving their will or harming them. Personal magic in particular has the peril of descending into sorcery, in which the caster becomes the tool of “elemental forces” – demons from the human unconscious, more terrifying than the Devil and his minions because they are not bound by the same rules. Now I’m curious about reading that book Meditations on the Tarot. And I see that the entire month of your posts from July 2010 are related to this. I must go read them all! Wizards and sorcerers in fantasy commonly draw on aspects of the naturalist/alchemist proto-scientist archetype; they can do things beyond the ken of mortal men by drawing on the ancient lore of Aristotle and from observations of the natural world which many miss. Prior to the modern age, priests and naturalists were often one in the same, as the quest to understand the natural world was also considered a means toward a greater understanding of God. Often they were some of the only individuals in a community afforded an education. Lots of the early 18th biologists, geologists and paleontologists were ministers. Thus, maybe, the ideas of the priest drawing on divine power and the mage drawing on natural laws can be reconciled as individuals obsessed with gaining a higher knowledge of the world’s laws, although with maybe different ultimate goals. Agreed. This is a nice schema, especially for an early modern setting. Newton as alchemist, etc. Also, there is the idea that priests accept God’s law whereas sorcerers accept no law above their own. Yes! I like that. Sorcerors are the sages and wise men who heed no rules or restrictions on their research, while priests are those who try to cut no corners in their path. But both pull their power from the same well: the secret knowledge of the laws of (God’s?) Creation. I was preparing a post on this very subject! I really like the idea that no-one in the world has any special connection to “the gods”. No-one knows if they’re real. Clerics are shysters using magic to fool and scare people into paying tithes. Yeah, I think keeping the ultimate metaphysics ambiguous is a useful tool in maintaining mystery and preventing everything from seeming too mechanical. I don’t think you need to assume all clerics are frauds, however, unless you are running a very cynical campaign. Clerics could truly believe that certain spells come from the power of God and other spells come from the power of Satan, for example. * Thaumaturge – These have an innate connection to, or intuitive understanding of one or more divine beings. Some only have a single gift, while others are able accomplish anything their patron sees fit at the time. Saints, miracle workers, oracles, prophets, divine madmen, etc. * Priests – These lack the intuitive insight or personal connection to the divine, but they dutifully enact the rituals prescribed by a given spiritual patron to good effect. * Sorcerers – Might draw their power from either innate spiritual connection (imp whispering in the ear) or ritual spiritual practice. But the goal is not to serve but to use the power to one’s own ends. Might even draw power from rival divinities, playing them against each other in a dangerous game. * Philosopher-Scientists – Learn about the world and develop spells through a rational and inductive lense, rather than the intuitive connection that thaumaturges have, or the rote practices that priests use. Tend to view divine connection as a crutch. * Magi – Combination priest/philosopher-scientists. * Hedge Wizards – Combine sorcerer and philosopher-scientist practices. Some might apply the spells without fully understanding their workings. * Charlatans – Use one form of magic to fake another. This even leaves out psionics and other weird phenomena innate to one’s person, rather than from outside sources. Agreed. All of those (or combinations thereof) could make for good settings. On one side you have the remnants of the Norse gods and a few mortals(?) using mainly rune magic. On the other side you have a quazi-christian, quazi-rationalist group powered by . . . something else, or is it something else? Yeah, such things are going to depend a lot on the setting details. I tend to make my divinities more remote than they are often presented in published campaign worlds (to the point where it is unclear whether gods as such exist at all — they could just all be powerful demons or extra-planar beings). This idea is more about getting rid of all the other kinds of magic. No clerics, no druids, no shamans per se. It’s all just magic, and the church (whatever church that is, though my implicit model here is monotheism) just think some magic is okay and other magic is nasty. Are they right? Why should the players know beforehand? Why not let them make up their minds through play? Great post. I really like the idea of making magic use and spell development contingent on decisions made in the game. I’ve been banning clerics in my game for a while now for this reason – a predictable tap for divine power takes some of the mystery of the game away for the players and me. The questions connected to magic are some of the best story-generating questions the game offers. The more open it can stay, the better.